Rob was able to assemble the chair using a single pallet and basically figured out what worked for him along the way. Then he used a belt sander to sand it down with 50, 120 and 330 grit paper. Then he stained the chair with some leftover stain from a previous project. Here is what the chair looked like with and without the stain. Here is the finished chair after it has been stained. We are looking forward to using these in our yard this summer. Thanks so much for stopping by our blog! Enjoy your day. From pallet to chair. An incredibly transformation! Wow, you guys totally rocked it! Megan those are very cool! They look like they would be great in the garden - cool and comfortable! Came over from Gunny Sack. This is great, they turned out fabulous! Love this idea!! Newest follower from Not Your Ordinary Show & Tell Party. Looks fantastic--and I have a couple of pallets! Another great pallet idea! Love it. I'm passing up pallets left and right while I decide what to try first. This one is so cool and looks pretty straightforward. Thanks for posting it! Great idea! Love the use of the pallets! I LOVE THIS!! Thanks so much for linking this up!!! I saw a bench similar to this!! So great what all you can do with pallets! what a fun and unique idea! beats the expensive wooden adirondak chairs any day! What a great chair! I hadn't seen these on Pinterest. Wonderful use of a pallet! Stopping by from Someday Crafts. Lovin your chairs. And, I just found 3 pallets at a dumpster a couple days back. Of course I backed the truck up to the dumpster and away they went with me. One of them just might have to become a chair. Awesome - I think I need to get onto Pinterest - and soon!!! This is such a clever idea, I love all the various uses people find for pallets. You come up with such great ideas. These are really fun. Great idea! Thanks for sharing at Terrific Tuesdays. Looks great!! (I must have missed out on the pallet chair craze as well.) Thanks so much for linking up at Romance on a dime! Great transformation. I love the darker color. Thanks so much for sharing at Tout It Tuesday. Hope to see you next week. Love this!!! I have a pallet in the garage just calling my name! If it would stop raining for just one day I would totally do this! Thanks for linking up to Fantabulous Friday this week!! these are totally cute. You have made me want to goout and grab a pallet or two from the back of a store to make these. I would love if you linked them up to Show Off Monday @ Kampenlane.com on Monday. Wow, this is insane! 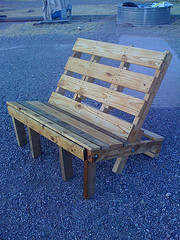 I would have never thought you could make a chair out of pallet. Great job! I will be featuring this on Monday @ Southern Lovely! I'm a new follower. Love the chair and love your blog! Love this chair!!! I had to share it with my readers at somedaycrafts.blogspot.com. I will be featuring it on Tuesday. I am wanting to try some pallet projects so bad...they are so cute. Love this! Thanks for linking up and sharing with us @ Toot Your Horn Tuesday. I'm featuring this project this week. Feel free to come and grab your feature button. Great job! FABULOUS!!!! They look super comfy too... are they?? CONGRATS!! You've been featured at The DIY Dreamer.. From Dream To Reality! What a great chair! I have featured you on this week's Blog Stalking Thursday. I would love for you to stop by to grab a featured button and wear it proudly! I can't wait to see what you are going to link up this week! I absolutely LOVE this chair!! I am so going to make one of these!